Which is the best? The 2002, for sure. Which should every Clos des Goisses fan drink? The 2001, of course. The House of Philipponnat made a double release at the end of 2011: the 2001 and 2002 back to back. Clos des Goisses 2002 is a great, great wine, but Clos des Goisses 2001 is nothing short of a miracle. Mind you, it is the sort of miracle that Clos des Goisses has a reputation for pulling off. This vineyard is planted on a steep hillside (“gois” in the old Champenois dialect means inclined or slanted), which is located on the left-hand side of the road when leaving Mareuil-sur-Aÿ in the direction of Tours-sur-Marne. In my opinion, it is the most exceptional of all special terroirs in Champagne because it has the unique capacity to produce great Champagne year in and year out, regardless of the quality of the harvest throughout the rest of region. Although it is possible to produce great Champagne every year regardless of the quality in general, to achieve that anywhere else you have to have access to a large and diverse range of vineyards spread across the region, and you must be absolutely ruthless when selecting wines for the assemblage. There is no other individual vineyard in Champagne that has the ability to do what Clos des Goisses can do every year. Not that strict selection does not enter the equation even for the greatest vintage of Clos des Goisses. This vineyard is 5.5 hectares in size, which is sufficient to produce 50,000 bottles annually. However, to achieve a level of quality that reflects and does justice to this terroir, the yield is restricted in the vineyard, mostly by pruning, and it is further reduced through selection at assemblage. This is why most vintages of Clos des Goisses fall somewhere between 10,000 and 15,000 bottles, but for difficult years, the production is lower still, and for a year as difficult as 2001, only 5,000 bottles could be produced. If you look at these parcels on a map it is interesting to see that while the 2002 is a fairly conventional assemblage of a solid block of vines stretching from Collet in the west to Croix des Goisses in the east, Charles Philipponnat and Thierry Garnier, his chef de caves, obviously had their work cut out piecing together the 2001 assemblage, which consists of one small central block (Le Chalet, Jolivet Noir and Jolivet Blanc), mostly on the lower slopes, with two separate parcels on the western edge and one to the east. The miracle of 2001 is the Chardonnay from Croix des Goisses, which achieved an unassisted 11.% potential alcohol by volume, which is astonishing for a vintage that averaged just 8.5% across the entire Champagne region. What are these vintages like? In October 2011 when I first tasted the commercial release (as opposed to an earlier trial disgorgement), the 2002 was chock-a-block full of fine floral autolysis, dominated by notes of acacia, and its dosage had yet to integrate, tasting far sweeter than its modest 5.8g/l of residual sugar would suggest. This clearly indicated three things: one – the wine was unready; two – the 2002 is going to be a classic Clos des Goisses in as much as it will take a year or so to settle down in bottle (and as the first release of both vintages was disgorged in June 2011, it should start to drink well from June 2012); and three – it is a vintage with great potential finesse. Under ideal storage conditions the Clos des Goisses 2002 will benefit from many years, possibly decades, of post-disgorgement ageing. Although I would normally worry about the capacity of any Champagne to age gracefully with less than 6g/l of residual sugar, six cannot be a magical number for all producers, styles and vintages of Champagne. There must be some leeway either side of six and for Clos des Goisses the dosage would never alarm me unless it went under five-point-something (lower than this, if late-disgorged for consumption rather than laying down). When the dosage melts into the fruit structure of this wine, it will start to develop a dried-mixed-fruit complexity of aroma, but the 2002 will always be defined by an exotic richness of fruit that is reminiscent of Clos des Goisses in 1992 and 1976. While the 2002 does not have the acidity of other great Clos des Goisses vintages, it more than makes up for in its firmness and focus. Being just one year older, higher in acidity and lower in both pH and alcohol, I imagined that the first commercial release of 2001 would be a tad lighter than the rich and ripe 2002, but it had in fact such a deep colour that it looked more like a 2003 than a 2001. Indeed, it looked as if it was 10 or 15 years older than the 2002. Initially this worried me, but there was no evidence of oxidation on the nose, which was as fresh as a daisy. Furthermore, there was no hint of oxidation even when I tasted the same wine three days later, having left the re-sealed bottle in a refrigerator for three days. This is a way of fast-forwarding a wine’s development, but, if anything, the 2001 tasted even fresher. I asked Charles Philipponnat if he could explain the deep colour and he told me “Being 2001, my explanation will sound unlikely, but it’s a bit of over ripeness! As a rule of thumb we try to pick at the peak of physiological ripeness, but in 2001 the véraison was peculiar. As the increase in sugar content was slow, we waited a little beyond physiological maturity. For better or worse? Judge for yourself.” Well, as most readers will know, I hate the term “physiological ripeness” – ripeness is a physiological process, so you might as well ask me how chronologically old I am. This tautological term is usually deployed by red winemakers to justify harvesting grapes that are so overripe that the wine will have what’s known as “dead fruit”. In this case, I think Charles is merely trying to emphasise that he waited beyond the point of ripeness. Ironically, because of the hotter terroir on Clos des Goisses and the fact that the vines are always pruned for a lower yield, this still meant that the vines were harvested one week before the rain, which following a cold summer filled and burst a huge crop of unripe grapes, and rot became rampant. The 2001 is not an aperitif Champagne, but it is a fascinating Champagne to accompany food, with its profound richness of honeyed fruit and quite surprising minerality. Rather than pitch a miraculous version of a poor year like 2001 against such a great vintage as 2002, it might have been better to have released 2001 with 2003; both very difficult years with an equally deep colour. They could have been launched as early as 2008 to show them off at their very earliest and freshest window of opportunity (the 2001 was already showing an elegant freshness of drinkability a year earlier, at my Christie’s Champagne Masterclass in December 2007). I would also have sold part of the stock in pairs, which is to say one bottle of 2001 with one bottle of 2003. By releasing the 2001 at the end of 2011, when it was a good 10 years of age (generally regarded as the youngest age that Clos des Goisses should be drunk), Charles Philipponnat was obviously trying to make a point: that even in poor vintages (and 2001 vies with 1984 for the dubious honour of being the worst vintage in the last 40 years!) Clos des Goisses can be released at 10 years of age. Indeed it can (the 1951 Clos des Goisses, for example, was superb in 2007), but Clos des Goisses from so-called poor years are also ready to disgorge earlier, which is something else its aficionados would be fascinated to experience. Charles Philipponnat could have had his cake and eaten it by holding back, say, a thousand bottles to release in small lots as a library vintage over the next 10, 20 years or more. It’s easy for me to say that now, but it’s quite different when you are the decision-maker and all in all, Charles Philipponnat has been doing a splendid job. 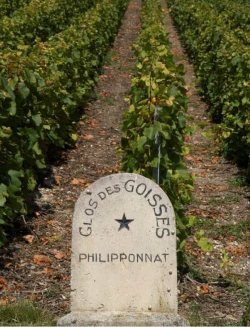 I think his great uncle, Pierre Philipponnat, who purchased Clos des Goisses in 1935, would be very proud of him, especially for returning this great vineyard to its true destiny: to produce great Champagne every single year.